Want to Know How You’re Taking a Big Step towards Building a Top-Notch Team When You Outsource Accounting? When you outsource accounting you’re giving yourself more room to hire the best in-house team possible? How? By shifting a big chunk of your basic compliance work, bookkeeping, payroll work, and so on overseas you’re left with far more time and money to put into hiring rock-stars instead of settling on the best you can afford at a much reduced rate. Let’s take a look at 4 factors that should go into your building a dynamite financial team. When you outsource accounting you’re freed up from taking on bad hires. 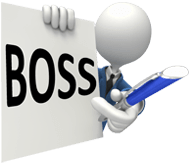 BOSS provides you with a deep pool of certified and experienced overseas team members that come with an added bonus – you don’t have to directly manage them. This isn’t to say that you’re denied input into how they work with you. You are in fact encouraged to tweak your relationship with your outsourced team members and their manager so that you work together as efficiently as possible in the manner of your choosing. However, you don’t have to do any daily handling of your overseas team – that’s handled by your assigned manager. On the flip-side, you do have to manage the people you have working for you at home in your office. When it comes to in-house teams bad hires are a definite possibility. Someone who came across like gold during the interviews might not work out in actual practice. Or they may have a bad attitude which brings morale down. When you outsource accounting you send the work out and it comes back in a high-quality and timely form. That’s more or less the entire transaction. But with in-house hires you’re not only taking on a worker’s skill-set, you’re also taking on every interaction they will ever have with every other worker in your office (and possibly every interaction they’ll have with clients, depending on their position). If a bad hire is bringing down your office it’s up to you to get them out of there. Firing is just as much a part of your job as hiring people, and it can be a game-breaker to keep a bad hire on staff. Even if your firm likes to outsource accounting to a large degree you still need to think about the appearance of your office. Take a look around your workspace – how would you describe it? The design of your office has a major impact in two main areas. The first is on your in-house staff. Is this a place where a person would want to work? Or does it look like the epitome of some dreary government office environment with drab paint and tired furniture? The second way your office’s décor is going to have an impact on your business is that your clients are going to take an impression from it. If it’s drab, you’re not going to look very successful. If it’s well appointed, you’re going to look like a firm that gets things done. Since you outsource accounting you’re going to have some extra cash lying around. Putting some of that money into making your firm’s office an inspiring place to work will boost your team’s morale as well as make you look like a success. Plus it’s a way to set up an easily achievable goal on your calendar, and every goal that you reach is another reason to celebrate, which in turn will boost your staff’s good vibes to an even greater degree. This is a step up on the hiring ladder. You’ve now chopped the dangerous dead wood from your tree by getting rid of bad hires. So now you have people with good attitudes and a solid skillset working for your firm. It’s time to drill a little deeper and make sure that these people want to be accountants. It sounds odd, but you’re sure to encounter some people who see accounting as their fall-back plan, or as the easy route to making a living. That may sound fine at first, but you outsource accounting in order to facilitate your firm’s growth. Growth means change. Some people, especially those who are in the industry because they want nothing but security, are going to drag their heels when it comes to your firm attempting new things. Their reluctance is going to become palpable and will drag the others down with them. The enthusiasm for new projects and challenges has to be built by you, the leader, but be aware that some people are simply not going to get on board, and they’re certainly not going to be putting in the effort and enthusiasm you need to help you attain your goals. It’s time to do a little more pruning. Your team is going to be happiest, and certainly at their most efficient, when they know exactly what is expected of them. Talent that hasn’t had their roles clearly defined are always going to be nervous that they’re not giving you what you need. By the same token, you’re not going to be sure your people are giving you what you need. That means you or your managers are going to have to be micromanaging, constantly looking over the shoulders of your employees. That’s a waste of your time and makes your employees feel like they aren’t trusted. Employees who don’t feel they’re trusted are going to be much harder to get fired up when you announce the goals for your firm’s future. One of the side benefits you’ll find you gain when you outsource accounting is that it makes you create clearly defined workflow documents (if you haven’t already) in order to have all your clients’ info ready to be fired overseas. These workflow docs may seem confining at first, but those limits are actually going to free up your team and make them much happier in their work. They’ll know exactly what you want from them, and how you want it to be achieved. The docs will also mean that you no longer have to micromanage anyone, freeing you up to get busy growing your firm.